In 1911 there was a large wave of strikes of schoolchildren across the UK, which mirrored the mass unrest in workplaces. Similarly, 22 years earlier there was another wave of walkouts which began in London shortly after the workers' victories in the great dock strike in London and the Glasgow dockers' go-slow. In imitation of the East End dockers (some of whom would of course have been their parents), children in East London initiated the walkout. The London children made banners emblazoned with 'No cane', 'Shorter hours', 'No home lessons' and other libertarian slogans. Historian Clive Bloom described that in Bethnal Green the schoolboy ringleaders were seen to carry red flags and wear “scarlet liberty caps”. The children attending a dozen board and other schools in London have left school. They demand that the school hours shall be shorter, that home lessons shall be abolished, and that there shall be more holidays. They are intimidating those who continued to attend school. To-day 500 children marched through the streets in a procession with banners flying, some of them having been driven in by their parents or by neighbours. The strike spread rapidly across the country. I have been able to find references to schoolchildren walking out over the next few days in Finsbury Park, Homerton, Woolwich, Plumstead, Kennington, Charlton and Lambeth in London, West Hartlepool and Middlesbrough elsewhere in England, and Rattray, Blairgowrie, Hawick, Edinburgh and Dundee in Scotland. Infected by the strike contagion at present passing over Scotland many of the boys at Rattray School refused to resume lessons on Tuesday forenoon and proceeded to Craigmill and subsequently to Blairgowrie but failed to induce the scholars at these places to join their ranks. The strikers caused considerable disturbance but the movement was short lived most of them returning to school the same day, where they were duly rewarded for their pains. A band of them congregated at the Cross, hooted and shouted at those who wished to return to work and at some of the teachers who passed and otherwise attracted attention. The sound of the bell and the appearance of the Headmaster however was too much for the courage of the strikers who made a rush back to school where they were promptly dealt with by the teachers for disorderly behaviour - this reckoning doubtless accounting for their refusal to join their Rattray friends on the following day. a demand for fewer hours and less lessons is the nominal reason assigned for the escapade but in fact most of the scholars will confess that they really came out ‘for a lark’. The good town of Hawick, the capital of the Borders, has acquired a fresh claim to notoriety. It is the scene of the latest development of the strike movement. 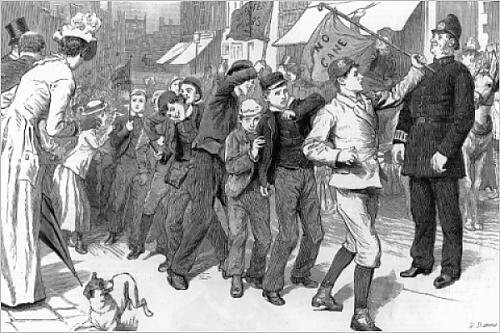 Following the example of the dock strikers, they organised a public demonstration. Having formed a procession, they marched through the streets of the town between the two rebellious schools, appealing in this way for public sympathy and support. Their proceedings were perfectly orderly; and when the local police were asked to interfere they declined, as the Metropolitan Police did, on the grounds that it was a private quarrel, and that neither life and property was endangered. The leverage on which the little rebels rely is the belief that, if they disqualify themselves for presentation to the inspector by absences there will be a loss of the Government grant, which will tell upon their teachers and on the ratepayers. They forget, however that there escapade me entail on them another year's attendance at school. There is something comical as well something very shocking in those demands. What the boys want, in fact, is to assume the functions of the school board and at the same time to exchange places with their masters. Schoolboy strikers… are simply rebels. Obedience is the first rule of school life… School strikes are therefore not merely acts of disobedience, but a reversal of the primary purpose of schools. They are on a par with a strike in the army or navy… They are manifestations of a serious deterioration in the moral fibre of the rising generation… They will prove dangerous centres of moral contamination. Over 100 years later, this spirit of rebelliousness has remained, as thousands of children walked out of classes in 2003 against the Iraq war and in 2010 against government cuts to education. The Graphic. 1889, page 473.